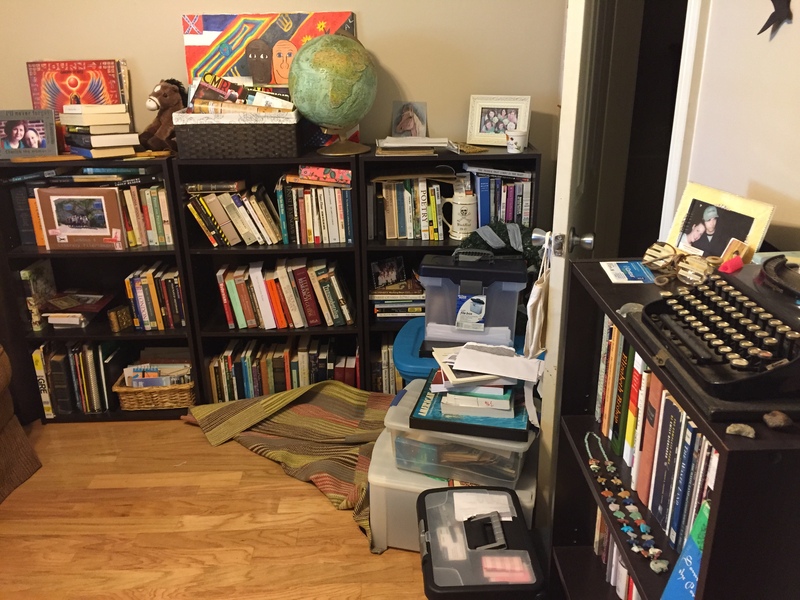 My home office is always a disaster, constantly doubling over as a sanctuary for my cats and a storage room for the piles of papers and boxes that my husband and I don’t know where to put yet. 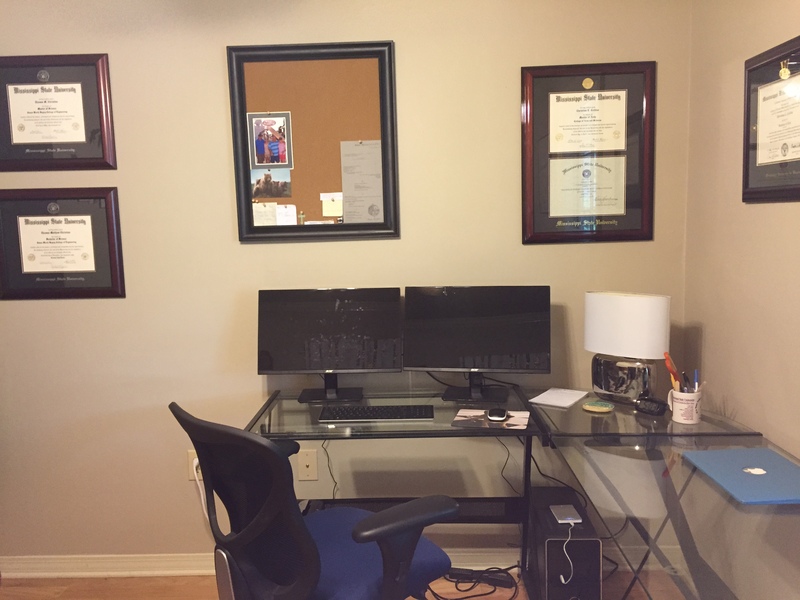 But, as of a few weeks ago, my home office became my only office, at least for the next seven months, which means that I had to make it a workable space, one that I could actually see myself walking into in the morning with a cup coffee. 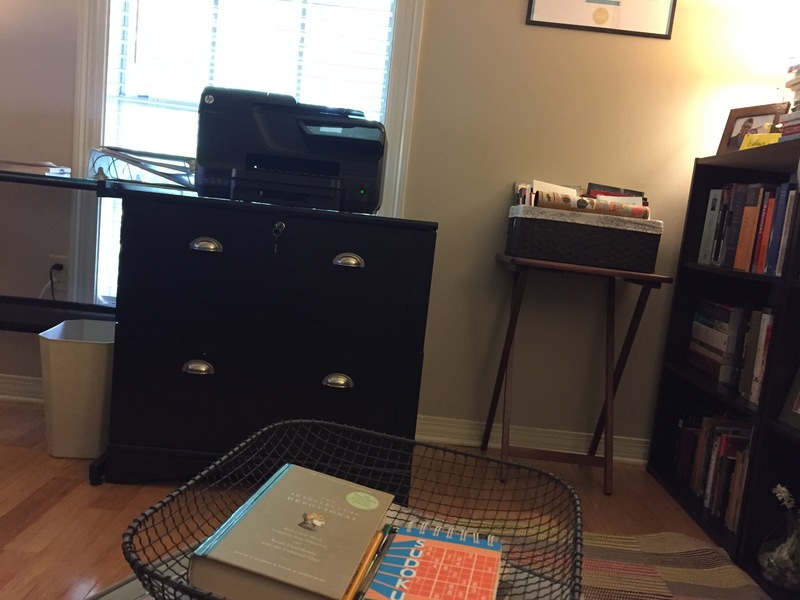 Before I reorganized the office, my husband and I both had already stopped using it in any productive capacity. 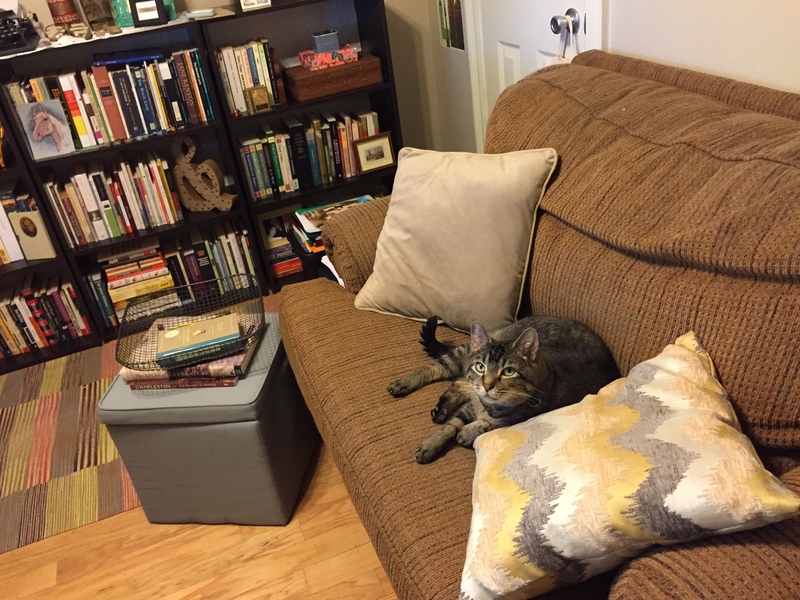 Boxes of storage lined the walls, books were everywhere, cat hair clung to the rug and the chair. It wasn’t unusable, but it wasn’t an environment that I wanted to be in for very long, especially not one in which I wanted to sit down and wait for the creative muse to come and whisper in my ear. Let me just say – I wouldn’t call myself an organized person, but it does feel good to be in a space in which every item has a place. My thoughts are scattered, hardly ever organized. I need to work in a place that isn’t a disaster like my mind always seems to be. 1) I bought a filing cabinet. 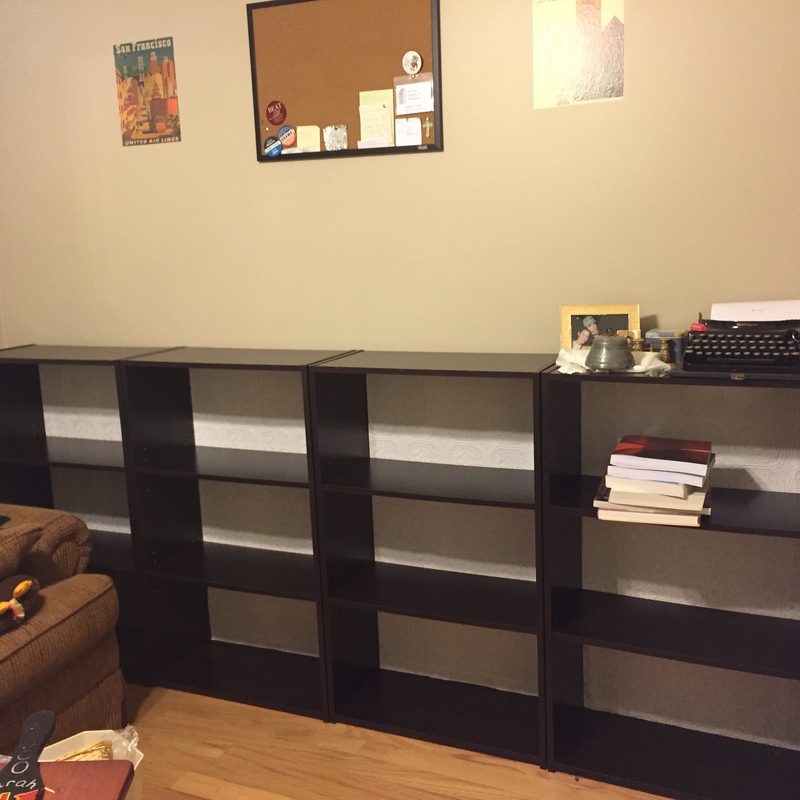 2) I redid my bookshelves. 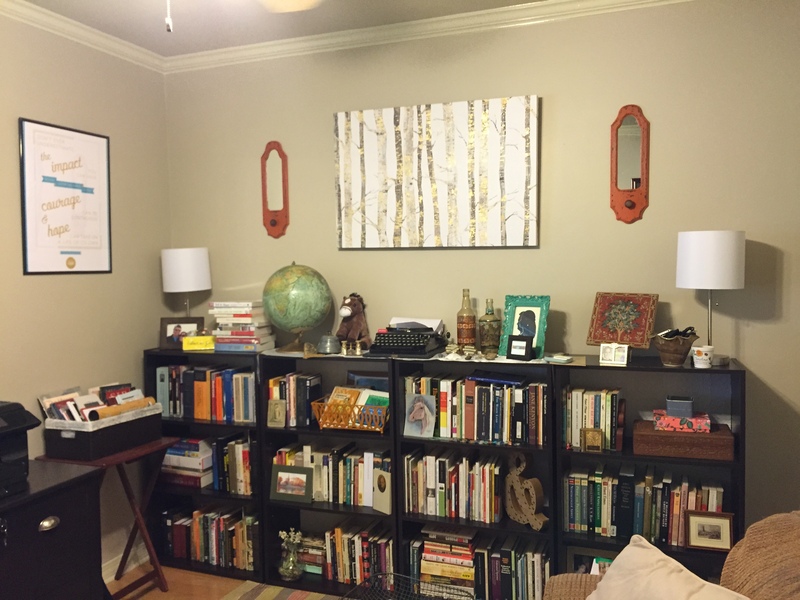 3) I added two more lamps and new art/décor. I can’t believe I only just recently bought a filing cabinet. We bought a two drawer set-up (pictured below) from Office Depot that looks like a piece of furniture. I now have ample space to file away not only personal documents but also school and work documents. My bookshelves were probably the biggest overhaul, and I know that for some people bookshelves aren’t even a part of the home office space. But, for the PhD student in Literature, they are the focal point of the office — and of the work, for that matter. I first moved all my bookshelves to the same wall to consolidate space and to create a single bookshelf look. Then, I had to do something about the coloring. They were so dark that they really dominated the feel of the room. I had seen on Pinterest a few months ago that people were starting to wallpaper the backs of bookshelves in order to update the furniture or just to give it a different feel. So, I went to Lowe’s and found this paper I liked – I knew I wanted to go light since the shelves were so dark. 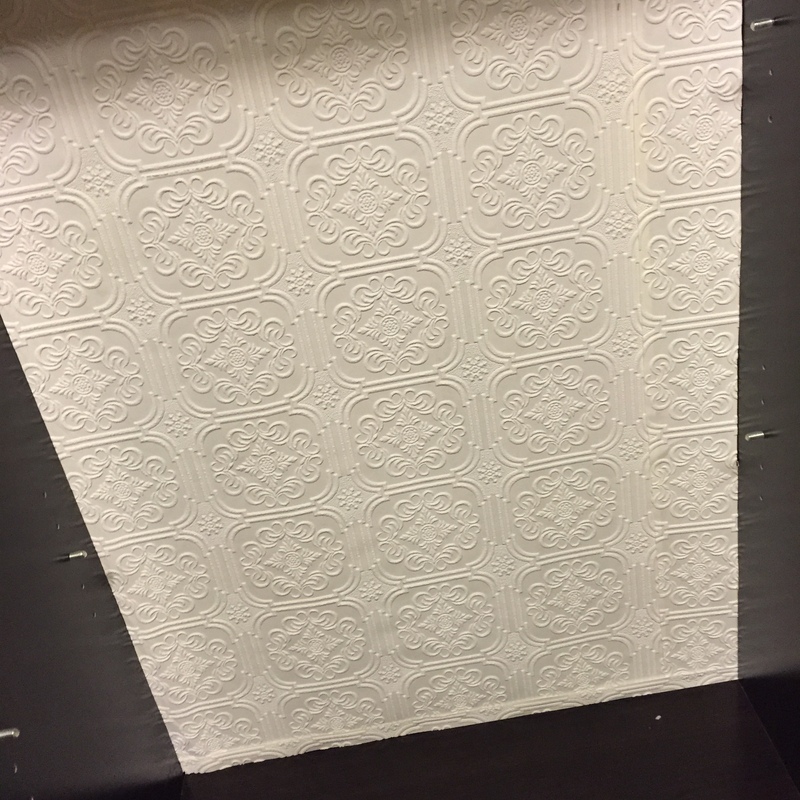 I cut and pasted the wallpaper to the inner back of the shelves with little trouble. Also, the paper I chose can be painted, so that could be another touch added. After, I was pleased with the new look. Not as dark and formal as before. The next task was to put the books and other items back in a new order. I differ from other readers and writers in that I don’t keep every book I buy. I only keep books that I truly think I’ll refer back to in the future. So, as I was pulling books off the shelves before the wallpapering, I made a stack of books to give away/sell on Amazon. I also stacked the unshelved books in categories by genre. Most of the information on Pinterest had women and men reorganizing by book color and size. Wow, those must be people who don’t actually read/use their books, although I will admit that the pictures looked amazing. 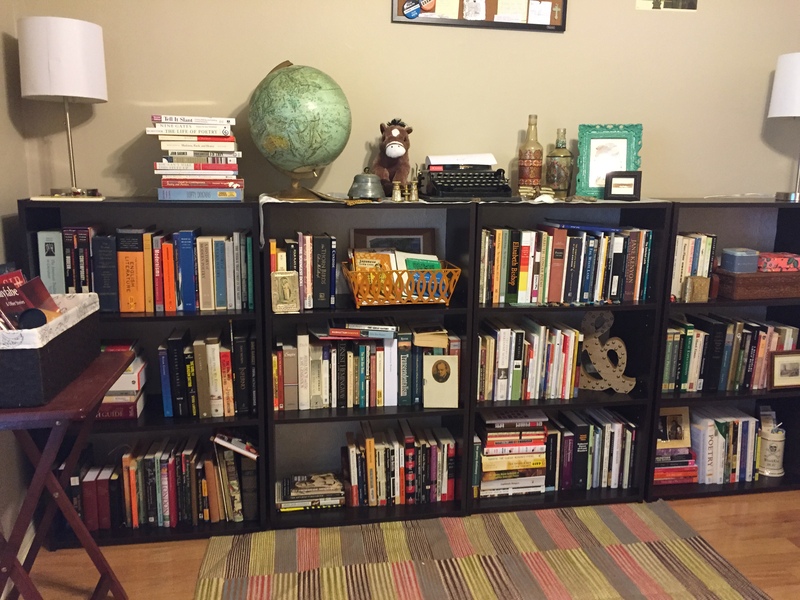 I organize my books by genre, sub-genre, and then alphabetical order for works of fiction, nonfiction, and poetry, meaning that I don’t bother with alphabetical order for reference books and anthologies. Then, I also added in favorite items – pictures, mementos, rocks, and pieces of art – to give my bookshelves character. My husband calls this my shrine to myself. Hmm, there’s probably some unflattering truth in there somewhere. Always, my 1928 Remington typewriter takes center stage on the top. Love the transformation! Your office looks a lot like I envision mine.